Wangui Muigai is a historian of medicine and science. Her research broadly concerns the history of health, particularly the role of race and gender in shaping illness experiences, public health policies, and healthcare. Currently, she is working on a book-length project on black infant mortality in the U.S. from slavery to the present. Her research has been supported by several fellowships and grants including through the American College of Obstetricians and Gynecologists, Radcliffe Institute for Advanced Study, John Hope Franklin Center for African and African American History and Culture, and Virginia Historical Society. 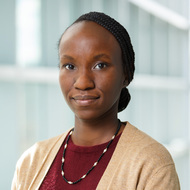 Wangui Muigai. "“Something Wasn’t Clean”: Black Midwifery, Birth, and Postwar Medical Education in All My Babies." Bulletin of the History of Medicine 93. 1 (2019): 82–113. Wangui Muigai (with Felix Rietmann, Mareika Schildmann, Caroline Arni, Daniel T. Cook, Davide Giuriato, Novina Gohlsdorf). "Knowledge of Childhood: Materiality, Text, and the History of Science – An Interdisciplinary Round Table Discussion." The British Journal for the History of Science 50. 1 (2017): 111-141.